Homeward Bound Adoption Events and CT Animal House are teaming up to raise funds for spay and neuter of CT shelter dogs. If every dog that left a CT shelter was already spayed/neutered, there would be fewer dogs in our shelters. Fewer dogs in shelters means fewer dogs euthanized. Sounds easy, right? Unfortunately some dogs are adopted out with vouchers to help with the spay/neuter expense but adopters don’t use the vouchers and ultimately, the dogs aren’t neutered/spayed leading to pet overpopulation. Frankly, there are just not enough adopters for all of our nation’s shelter dogs but we have to start somewhere and that’s where YOU come in. 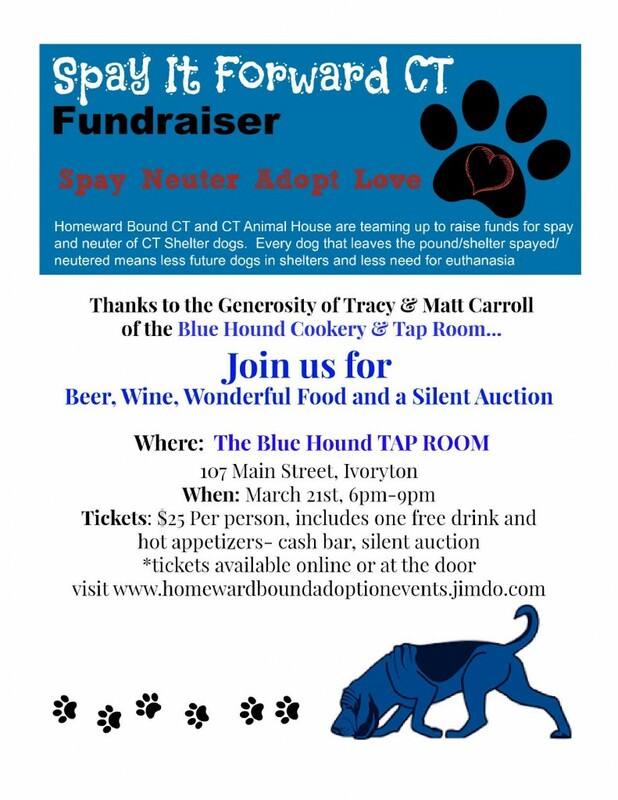 Please join us at our inaugural Spay it Forward CT event which will take place at the Blue Hound Tap Room (107 Main Street, Ivoryton CT) on March 21, 2016 from 6 pm – 9 pm. Tickets are $25 per person and include one drink and hot appetizers. There will be a cash bar and silent auction. Tickets are available at the door or easily ordered online at http://www.homewardboundadoptionevents.jimdo.com/spay-it-forward/. At this link, you may also make a donation, request help with spaying/neutering, donate your veterinary services or silent auction items.